Sensation is a mix of annual cosmos varieties with pink, purple, burgundy and white flowers. Early blooming varieties. Fern-like foliage. Grows to 1m tall. 12-14 weeks to flowering. 70 seeds per packet. Cosmos is native to Mexico. 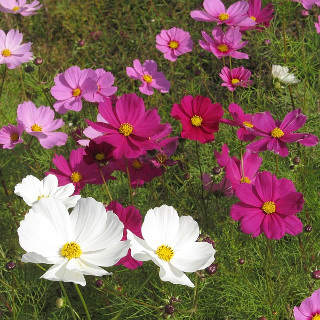 Sensation cosmos produces large, single flowers up to 10cm across that are held upright above the foliage and come in a mix of colours from dark burgundy and purple through to pale pink and white. Cosmos flowers will help attract beneficial predatory and pollinator insect species to your garden. Cosmos flowers are suitable for use in flower arrangements, although are short-lived once cut. Sensation cosmos was an All-America Selections (AAS) award winning variety in 1936. Cosmos is an easily grown, showy annual flower, it's a perfect species to grow if you want to nurture an interest in gardening in children and novice gardeners alike. While ideal for planting into mixed borders and cottage gardens, cosmos is also suitable for growing in larger containers if garden bed space is limited. Sensation cosmos grows best in temperate areas, but is adaptable to a range of climates and growing conditions. Cosmos flowers best when grown in full sun, however gardeners in warmer climates may prefer to plant cosmos in light shade to reduce heat stress on plants during the hottest parts of the day. Cosmos grows well in poorer soils. Cosmos grows tall so place them towards the rear if planting in mixed garden beds. To create bushy, multi-branching plants pinch out the central growing tip early on, leaving at least several pairs of leaves for new branches to grow out from the base of. If cosmos plants become too leggy and start falling over they can be pruned back hard and they'll re-shoot. Growing cosmos together in blocks will cause their foliage to inter-twine, this will help the plants support each other and keep them upright. Water cosmos plants regularly to prevent the fern-like foliage from wilting. Deadhead spent cosmos flowers regularly to promote additional bud formation. Cosmos may self-sow in the garden if growing conditions are ideal and spent flowers are left on the plants to spread seeds. Cosmos isn't affected by any serious pest or disease issues. In cold and mountainous regions of Australia sow Sensation cosmos seeds from mid Spring to mid Summer. In temperate regions of Australia sow Sensation cosmos seeds from early Spring to mid Summer. In subtropical regions of Australia sow Sensation cosmos seeds from late Winter to late Spring. In tropical regions of Australia sow Sensation cosmos seeds during the dry season, from mid Autumn to late Winter is best. Cosmos seeds should be sown 6mm deep, spacing plantings about 25cm apart to give their root systems room to spread while still being close enough to allow a solid carpet of cosmos flowers to form once mature. Cosmos seeds can be slow to germinate, with most seedlings emerging from the soil 14 to 20 days after sowing the seeds. Cosmos plants are fast growers and are quick to flower, expect your first flower buds 12 to 14 weeks after sowing the seed. Sensation is one of the earliest flowering mixes of cosmos and will continue to bloom all the way through the growing season.